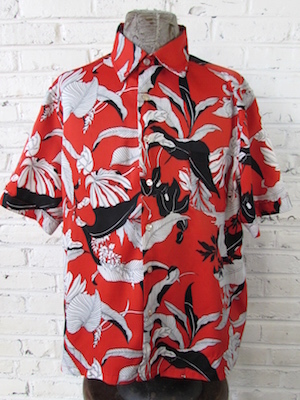 (XL) Mens Vintage 70s Hawaiian Shirt! Red w/ Black & White Tropical Flowers! 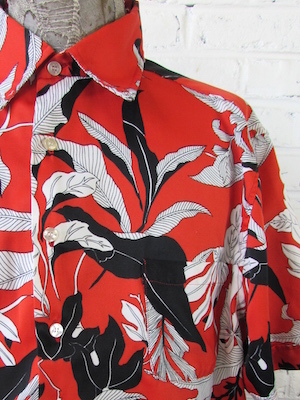 Home > Men's Vintage Shirts > Hawaiian Shirts > (XL) Mens Vintage 70s Hawaiian Shirt! Red w/ Black & White Tropical Flowers! Mens vintage 1970s Hawaiian shirt. Bright red base with black and white tropical flowers pattern. Closes in the front with pearly white buttons. Has a straight hem and one chest pocket. No material tag, but most likely polyester. Condition: Very Good. Has a few pulls in the material and pilling. Still a great Hawaiian shirt!